If you are a big fan of movies or music, I bet you have owned tons of DVDs ( new movies on DVD). For those who have huge DVD or CD collections, they surely have enjoyed a great sense of achievement while been suffering the agony of picking brought by those DVDs. For example, it may take you great efforts to declutter and to cultivate a home to make it tidy but not cramped. If you have a mountain of collections scattering around the room and run out of ways to store those CDs or DVDs, now you can say goodbye to the stubborn piles as here some smart and creative DVD storage ideas are shared with all you guys to store thousands of DVDs in a way more organizable, efficient, and space-saving. To keep thousands of DVDs intact without taking up any space, the ultimate way to organize your DVD collection is to digitize it completely. If you rip DVD to a digital format, the only space your DVD collection takes up is virtual space, other than a thin portable hard drive. If you have plenty of memory available in your computer, you could store it all there instead. 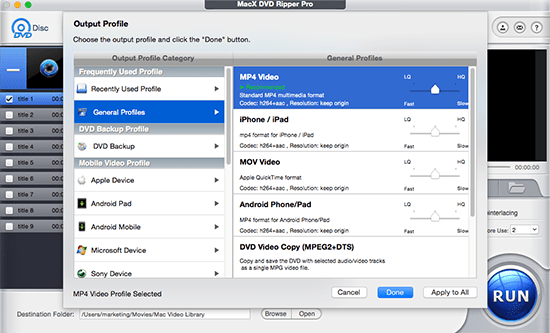 With a proper DVD ripper, MacX DVD Ripper Pro for example, you can copy DVD to ISO image, rip DVD to MP4 so as to store DVD hard drives/Apple Android devices with the DVD movie quality untouched and no space occupied. Furthermore, this professional DVD decrypter bapasses any DVD copy protections including the new Disney X-project protection, CSS, Sony ARccOS or region codes. 3. Choose the output format >> 4. Hit "RUN" button to start ripping. After you have ripped DVD to MP4, MOV, MKV, H.264 etc., there are various mediums to store DVD collections. Let's take a look at them for DVD storage ideas. External hard drive, like 3T Passport hard drive. USB flash disk, online Cloud disks. Micro sd card, such as 64gig. SD mico. Mobile devices like 128/256GB iPhone X/8/7/Plus, iPhone 6S/SE/6 Plus, iPad Pro, Samsung Galaxy S9/Note 8, HTC, Sony Xperia etc. You can use MacX MediaTrans to transfer the converted DVD movies to mobile device like iPhone iPad with ease. Laptop devices, namely Macbook Pro/Air, Chromebook, Microsoft Surface Pro 4 and so on. Speaking about unique and practical ways to store DVDs, to hide them somewhere convenient and space-saving is quite popular among families nowadays. For example, bed offers a lot of space for you to store DVDs. You can just install a drawer under the bed to fit more DVDs while stay easy to retrieve them when needed. Also, the bench used as the landing place to sit and put on shoes in the entryway is another good place to store DVDs. 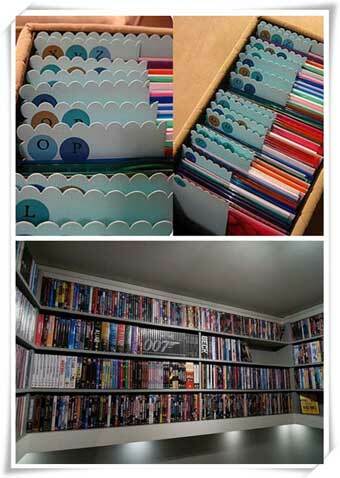 In fact, you can find more good ideas to organize DVDs by making use of hidden space. 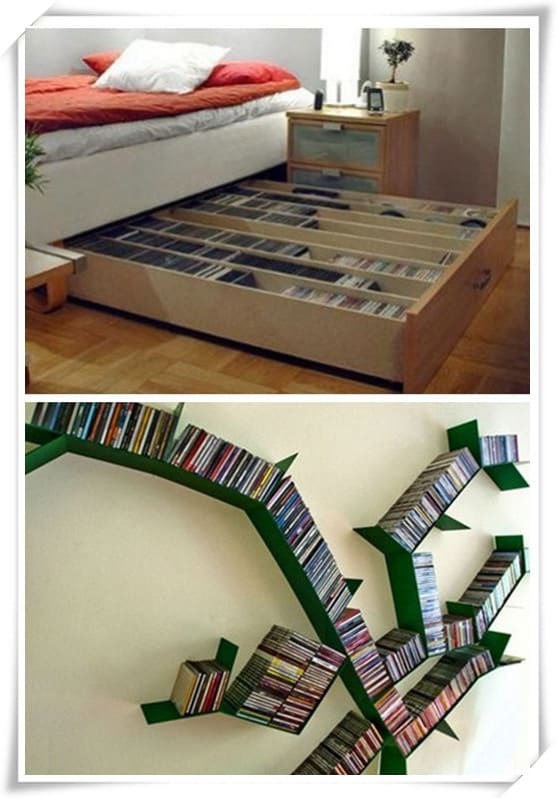 For those huge collectors of music or movies, CD/DVD saving shelves are also good options. However, a boring rows of upright DVD storage tower can hardly be an attractive addition to your room. As a matter of fact, you can add some special visual interest with DVD wall storage racks, also known as floating shelves by mounting them on the wall in a way to create creative letters or designs. One of the cool space to keep DVD collections is to make a shelf with certain unique shape, a tree-shaped shelve, for example. Just think out your own ways to copy and store DVDs while saving the room. For your reference: If you have bought tons of classic Oscar movies, Hollywood blockbusters, or movies from your favorite stars, a digital copy is quite a good idea to get rid of any possible physical damages to your collections. You may just copy DVD to hard drive, convert them to portable devices, copy DVD to DVD, store them in other memory device and even upload them onto cloud. Cabinets, drawers, boxes are also among the common space-saving DVD/CD storage ideas. If you don't want your DVD collection to be in plain view, you can store them in those DVD storing containers instead. These containers can be installed anywhere you can think out, anywhere you don't go often but can ensure their safety and accessibility like under the stairs. 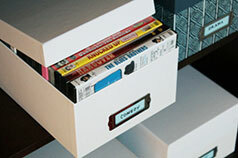 Besides, the DVD organizer units also vary, from boxes like shoeboxes to dedicated drawers. Rather than looking for space to hide your DVDs or pay for dedicated CD DVD storage cases, another cool DVD storing idea is to turn your CD/DVD storage piles into an art piece. For example, you can DIY a unique curtain with DVDs for decoration. Get several clear DVD pockets in the store and put them together into a creative and unique curtain. Also, you may use a big picture frame as the DVD holder to put in your DVDs and paint any pictures as you like. Note: Whichever solutions to store DVDs you have selected to keep DVD/CD collections, for better accessibility purpose, you are suggested to organize them by certain category like alphabet, genre, mood etc. And tabs can help you easily find the disc you want. Sum: While it is good to see that CDs and DVDs are getting smaller and smaller which makes the organization of them much easier, among those genius and creative DVD storage ideas, you are still suggested to make a digital copy of your DVD collections with a proper DVD ripper Mac. This comes mainly for two reasons. First of all, no matter how small those DVDs will be, they take up space. Besides, attention have to be paid to protect DVDs collection from dirt, dropping and aging. Also time will be needed to find the DVD movie you want to watch from the piles. So just backup your DVD in computer with DVD backup software, and stop struggling to make room for DVD storage. Fast Disc to digital conversion and copy with no quality loss, resolved! Five-star disc to digital software for PC and Mac can convert DVD disc to digital MP4 for playback on iPhone iPad Samsung Android etc.